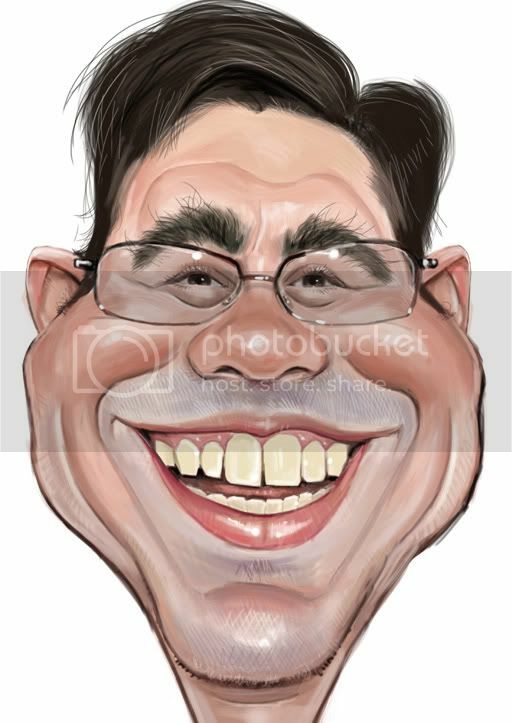 I've hit a rich vein of subjects that were born to be caricatured - now as caricaturists go I'm pretty kind - I shudder to think what some of my colleagues would do with folders of photographs I currently have. The clients wishes and, more importantly, getting paid have a major controlling influence - sigh ! Would really love to get a new from you with my glasses, if you ever get the chance give me a shout and I'll return the favour of course! Many thanks Damion, 'Scoops', Niall & John - appreciate that ! Righto 'four eyes' you'd better send a photo then - I'll get round to it some time - it's a long time since I drew you.